What can you do in a green phone box? Jump to media player Disused phone boxes in London are being put to a novel use - as solar-powered charging stations for mobile phones. How hackable are our cities? Jump to media player Ethical hacker Ken Munro demonstrates how key parts of modern city infrastructures can be compromised by computer hackers. Is this the future of urban travel? Jump to media player The BBC's Dougal Shaw tests out Honda's personal mobility device the Uni-Cub, a beta product shown off for the first time in Europe this week. The bike that 'teaches you to ride' Jump to media player A team of engineers has developed an auto-balancing bicycle which they say can teach people to cycle in an afternoon. The arcade where Donkey Kong lives on Jump to media player Video-game arcades have all but died out, but Mark Starkey has salvaged and repaired old machines to keep the arcade alive. Why Chinese flock to a Brighton chippy Jump to media player The seafood restaurant in Brighton, England, which has suddenly attracted a steady stream of pilgrims from China. 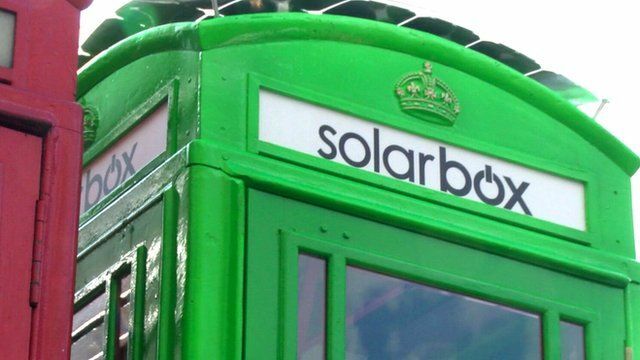 Disused phone boxes in London are being put to a novel use - as solar-powered charging stations for mobile phones. The first of six boxes was unveiled on Tottenham Court Road this week. The service is free to use although users will be shown adverts as they wait for their phone to charge. Technology reporter Dougal Shaw checked one out with Harold Craston, one of the team of newly-graduated students from London School of Economics who developed the concept. Go to next video: How hackable are our cities?